My last post was all about the ways my current job as a clerk at a mercantile is easier than my former job as a camp host/day use area attendant. Today I’ll share some of the ways being a camp host and a day use area attendant was easier than what I do now. #1 As a camp host/day use area attendant, I wasn’t expected to suggestive sell anything. 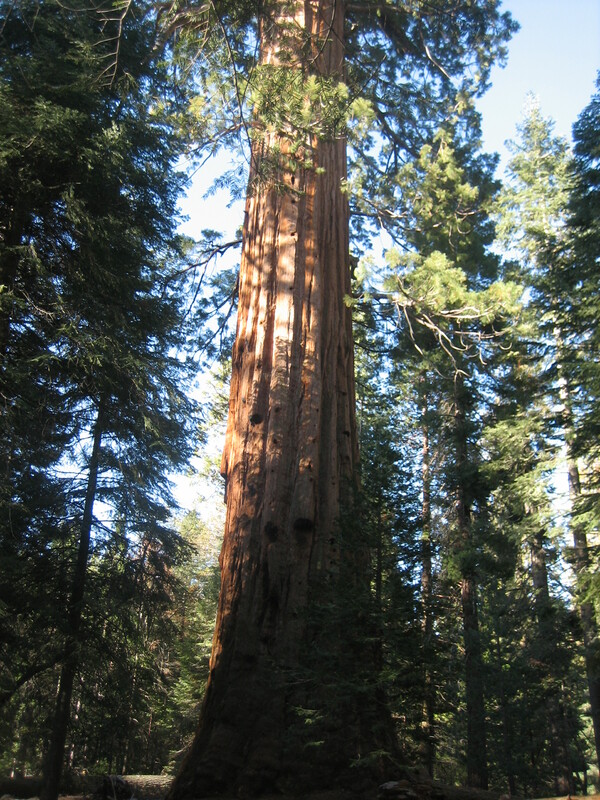 I took this photo of a giant sequoia. #2 I worked outside and could catch a breeze. The yurt I work in now sometimes reaches 90 degrees and breezes are rare. The yurt has open windows, but most of them are partially blocked by shelves full of merchandise. The additions of a fan near the cash register and a swamp cooler help, but I often miss being outside in the shade. #3 I’m currently tempted by consumer products all day. There’s not a lot I want in the store (the clothes are either polyester blends or don’t come in my size), but I do find myself wanted ridiculous things like wooden postcards and patches that are supposed to deter mosquitoes by enhancing the B vitamins in my system. #4 At the parking lot, I sat in my chair between collecting fees. There are no chairs in the store, and sitting on the counters is frowned upon. These days my feet and legs are quite tired at the end of my shift. #5 I miss my parking lot co-worker who quit his job before I arrived. #6 I no longer have my own campsite. The Man and I share my old campsite with the current camp host. It’s not terrible, but sometimes it does feel a bit crowded. #7 In previous seasons, I was the only person who touched the money for which I was responsible. At any given day at the mercantile, up to four people could have hands in the cash drawer. #8 I have to tell people about the yurts on site multiple times each day. In the past, I usually only talked about the yurts every week or two. #9 It’s not fun to tell people items they want are out of stock. #10 I seldom worked more than seven hours in a day as a camp host/day use area attendant. Working in the store, I pull two nine hour days each week. I’m looking forward to the overtime pay, but on those days, I miss the two hours of free time. #11 While people don’t seem to care what a parking lot attendant or a camp host looks like, I feel I should look a little more presentable while working in the store. Now I try to keep my clothes clean and my hair (somewhat) cute. #12 As a camp host, I set my own work hours. I could sleep late or spend a few hours writing in the afternoon before fulfilling my camp host obligations. The store has a schedule, and when I’m on the schedule, I have to be there, no matter what I’d rather be doing. If you want to read more about my adventures in the campground and day use area, check out my book Confessions of a Work Camper: Tales from the Woods. The collection of essays is available on Amazon as a paperback and an eBook.